Nick from the Guitaritus blog recently completed this personal project-- and it's got some real nice touches. Click on the photo for better photos you can click on & enlarge-- along with the build details. 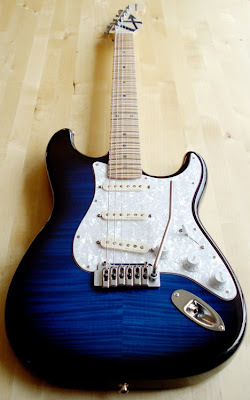 Basically, a nice ash body with maple top, Clapton Strat electronics with TBX, Wilkinson bridge, staggered Sperzels and an incredible piece of maple for the neck. 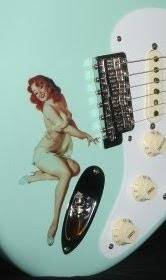 The neck was made by British luthier Paul Creedy of ArrowHeadGuitars .